What are the biggest assets a couple have? There’s property, of course, which remains the biggest of all. But after that, for most couples, come pensions, something many fail to consider when divorce rears its ugly head. Think about it: most people have a lot salted away in pensions so they can live comfortably after they retire. It might be an investment, but those different types of pension represent a large family asset. But something many remain unaware of, unless advised by a solicitor, is that the law does allow for pension-sharing. Like other marital assets, such as the sale of the family home, a pension can be split. It should be stressed – indeed, it can’t be stressed too much – that you need to talk to a divorce lawyer regarding the specifics of your divorce case and the pensions involved. But since 2000, couples who have money in an occupational pension scheme, a personal pension scheme, the additional State pension or a stakeholder pension scheme can share the value of those pensions. Pension sharing doesn’t apply to the basic State pension. That’s secure, and no one can take it away from you. If, however, you didn’t work during the marriage, you can replace your contribution record with that of your partner’s for the duration of the marriage. However, the right to use that vanishes if you remarry. But the State pension is essentially just a foundation. Millions do live on it, but it’s not an asset of marriage the way other personal pensions are. As a general rule, women earn less than men in their lifetimes; it’s an unfortunate but true fact. They may well stay at home to care for the children from the marriage, meaning that they’re not earning for a number of years. In either case they’re unlikely to have the same kind of amount in personal pensions as the husband, so they will be the ones who benefit from using pensions as a marital asset when it comes to divorce. That said, in cases where the wife has been the bigger earner, it’s the husband who can gain – there’s no discrimination in the courts. With divorce there are three main options regarding pensions. The family home could be “offset” against other assets – in other words, the wife would receive the house and the husband hangs on to his pension; this is often the case where dependent children are involved. 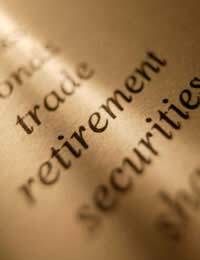 An alternative is “earmarking,” under which part of the pension is paid to the former spouse when the pension holder retires. It can apply both to ongoing pension benefits as well as lump sums. However, this can be problematic for two reasons. It stops there being a clean break between the former partners, and also, when the pension holder dies, the former partner stops receiving any benefits – even if that death is before pension age. Much better is the splitting of pensions. This does exactly what it says, and takes the pension, splitting it between the two parties so that they’re independent of each other. It should be noted that a date is set for the split and contributions to the pension after that date are not shared. In the middle of a divorce it can be hard to look to the future and think of pensions, but they are important, a major nest egg for security when you’re older. Always talk to your divorce lawyer about pensions as assets.